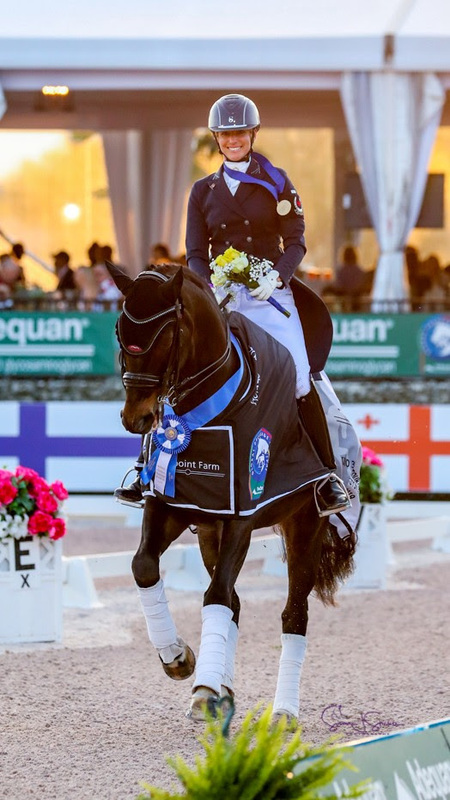 Tina Irwin of Stouffville, ON earned an impressive hat trick in the 2019 CDIO 3* FEI Nations Cup, presented by Stillpoint Farm, winning all three small tour classes hosted at the Adequan Global Dressage Festival (AGDF) 10 in Wellington, FL. After helping the Canadian Dressage Team take team silver with back-to-back small tour wins on March 13 and 14, Irwin rode forward for individual honours in the CDIO 3* Intermediate I Freestyle on March 15 aboard Laurencio (Laurentio x Donnerhall), a 12-year-old Oldenburg gelding she owns with her husband and fellow Grand Prix athlete, Jaimey Irwin. Riding to a medley of catchy tunes, including Avicii’s “Hey Brother” and “(I’ve Had) The Time of My Life” of Dirty Dancing fame, Irwin guided Laurencio through creative choreography to earn a score of 74.460%. Tina Irwin of Stouffville, ON followed up her team silver medal with the individual gold in the Intermediate I Freestyle aboard Laurencio during the 2019 CDIO 3* Nations Cup in Wellington, FL. After a landmark 2017 season, which included nine consecutive wins and a world record small tour score, the talented pair moved up to the grand prix level in 2018. However, Irwin decided to return Laurencio to the small tour in 2019 with the aim of representing Canada at the 2019 Pan American Games, and using their proven high scores at that level to help the Canadian Dressage Team earn their berth to the 2020 Tokyo Olympics. Irwin was joined on the Intermediate I Freestyle leaderboard by fellow Stouffville, ON resident, Belinda Trussell. The Canadian Olympian was paired with her up-and-coming mount, Carlucci (Contendro I x Compliment), a 14-year-old Hanoverian gelding owned by Barbara Holden Sinclair. Riding to heartfelt music that included works from Irish composer, Ronan Hardiman, the duo picked up a score of 73.535% to finish just off the podium in fourth place. Canadian Olympian Belinda Trussell and Carlucci dazzled the crowds with a performance set to beautifully composed music for fourth place in the CDIO 3* Intermediate I Freestyle. Teammate, Lindsay Kellock, who was making her nations cup debut in Wellington, was right behind Trussell in fifth place. Riding Floratina (Fidertanz x Rubin-Royal), Chloe Gasiorowski’s 11-year-old Hanoverian mare, she closed out her week on a score of 72.315%. 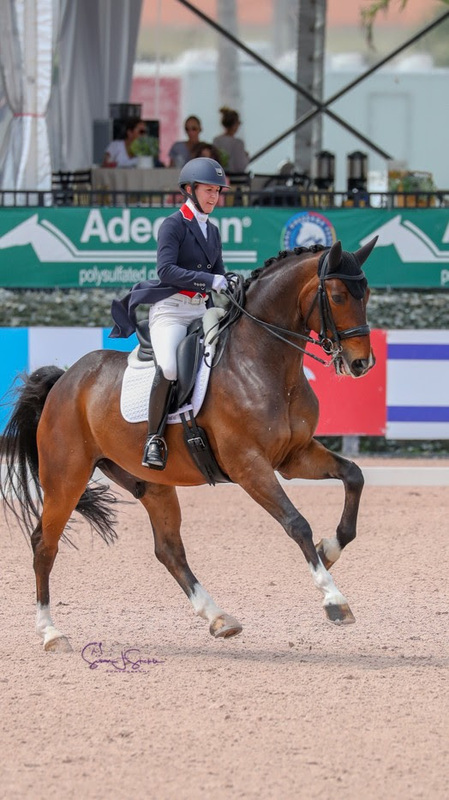 Canada’s sole representative in the big tour was Jill Irving of Moncton, NB, who has become a staple on the Canadian Dressage Team, and made her major games debut for the maple leaf at the 2018 FEI World Equestrian Games. Paired with Windhaven Farm’s 14-year-old Dutch Warmblood gelding, Arthur (Jazz x Contango), she earned 74.105% for fourth place. The final competitor of the day in the CDIO 3* Grand Prix Freestyle, Irving ensured the crowd left on a high note with her elegant performance, set to popular songs from The Greatest Showman soundtrack. The Grand Prix Freestyle was won by American, Shelly Francis, aboard Danilo, who was the only rider of the day to crack into the 80s, scoring 81.840%. Canada was also well represented at the youth level, with rising star Naima Moreira Laliberté of Outremont, QC stepping up to the individual podium in the CDIO-U25 Grand Prix Freestyle 16-25 on March 15. This marked Moreira Laliberté’s second podium appearance of the week, having also led Team Canada 1 to a silver medal finish in the CDIO-U25 Nations Cup on March 13. Paired with I Do Kiss, (French Kiss x Donnerfly), a 13-year-old Swedish Warmblood stallion she co-owns with KML Sàrl, Moreira Laliberté performed to a fittingly romantic mix of French-composed music reminiscent of a Paris café atmosphere. The performance won over the judges, who awarded her 71.160% for the individual bronze medal.